Ran 2930 miles! 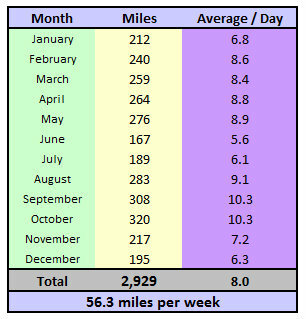 Average of 8.0 miles a day/56.3 miles per week. Wow, I've never even run 1500 miles in a year before. Quite a leap. Ran 16 races. Lots of 5ks, a few half marathons, and a mix of other distances thrown in there as well. 58 days of skiing (mostly in the Wasatch, but also including a trip to Lake Tahoe and Mammoth). 150,000 ft climbed during ski season! I'm convinced that this is what made the difference in our athletic pursuits. Personal record in EVERY DISTANCE I raced. 2011 has been such a special year for both Jake and I in our running. We began to realize our potential in the sport, and it was much better than we had ever expected. For example, last year at this time I couldn't even dream of running a sub-3:10 marathon, much less than a sub-2:50. My goal for the 5k was sub-20 and I ran 17:16. My goal for the half marathon was 1:25 and I ran 1:17:03. Best race of the year was definitely Long Beach Half Marathon. I have to give a ton of credit to Jake for coaching me - helping me to stay consistent and motivated, outlining all of my workouts, etc. His knowledge of the sport is great, and I have learned a lot this year about training correctly. Super Fun Mountain Biking - I've decided that cross country trails are the best for my mountain biking skill level! 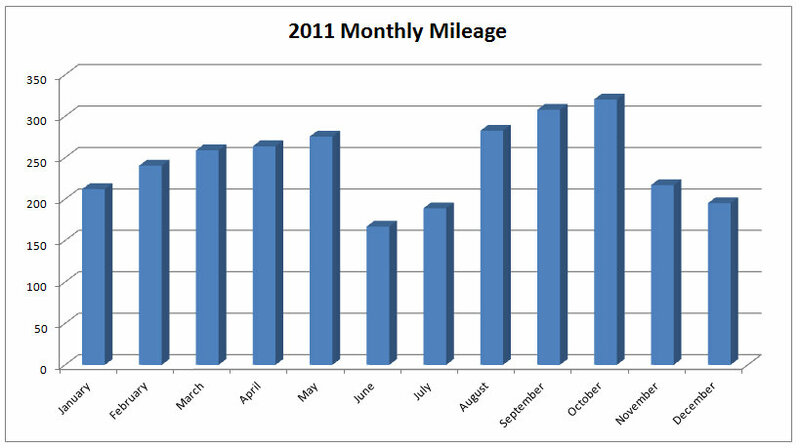 Hiking - We ended up not hiking nearly as much as in 2010 (skiing and running took priority! ), but all of the hiking we did in Moab was pretty awesome! I loved Fiery Furnace especially. Another trip back to southern Utah is a must next year. Getting promoted at work. I am now a Super Engineer nerd! Joining the fastrunningblog.com. This site has been a great resource for finding other runners in the area and being able to get running groups together, train with others, make friends, etc. I have found so much motivation in my running through this site. Buying mountain bikes. Our mountain bikes are awesome! They have become so useful in the warm months for cross training and trail riding. Because Jake run much more mileage and farther workouts than I do, I have been able to hop on the bike and ride along with him. Eating ice cream EVERY NIGHT! I tribute at least 15% of my happiness to getting to eat ice cream every night - one of the great benefits of exercising so much! Loved reading your recap. You truly had an amazing year and I am convinced it is all because you started religiously eating ice cream. :) 2012 is going to be great for you and I can't wait to watch your journey. Ice cream every day plus PR in every distance- can't beat that.